Hello hello! Our delayed Bloggers' Banquet was happily rescheduled for today. 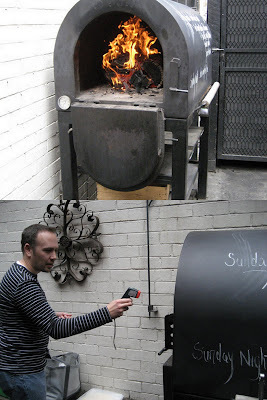 We had it in the courtyard of The Commoner on Johnston St, which, apart from being more resistant to Melbourne's changeable weather, had the added benefit of having a woodfired oven! 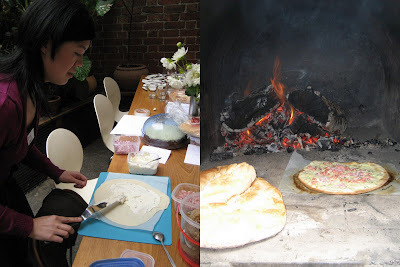 At first I was going to make German potato salad, but seeing as our get-together was more of a nibbles-and-drinks-thang than a BBQ, I decided to take advantage of the wood-fired oven and try out some Flammkuchen! I made the dough for the bases in the morning, and layered them up with baking paper in a plastic tupperware container, and brought all the toppings (chopped red onions, bacon pieces and sour cream mixed with thyme) in separate little containers. And once the oven was ready, I assembled them and we cooked them in the awesome oven. It was so cool! And the results were so much better than my domestic oven. I totally want a woodfired oven when I'm grown up. 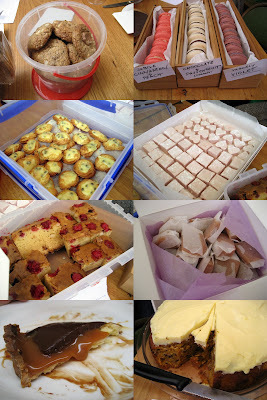 I didn't get close-up pics of all the food... but hopefully some others will be blogging this shortly??? Apologies if I assigned the wrong food to the wrong person or missed anyone out - there were lots of people and lots of food - give me a heads up in the comments and I can fix any mistakes. I was on a total sugar high after all those sweets. I especially loved the cinnamon and peach macarons (filled with white chocolate), yum! Thanh seemed to think his blondies were slightly burnt, but they tasted totally fine to me! And look what we found as we were packing up... GASP! Thanks to everyone for coming, and bringing delicious food. It was great to see some familiar faces, and meet some new ones. Thanks so much to Jo from The Commoner for hosting! 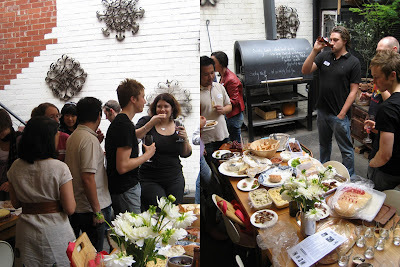 A great documentation of the event, Sarah:) It was a good space for chatting and eating. As for the macaron, we must not condemn those who do not appreciate a macaron... maybe it wasn't to their taste. BUT they could have offered the uneaten half to everyone else! Hehehe. Good photos from Sandra, and you wait. Your off angle slices will be exposed! Good meeting you, till next time...cheese and sugar...nom nom. A good round up Sarah. I think you might have missed the crackers from Asti from memory. Apart from that, you got it all. Good work on doing the liasing with The Commoner. It is indeed a great venue for such a gathering and very comfortable and relaxing. Being able to buy lots of different booze was good too. As for the macaron, I appreciate them very much, having eaten six (more than my fair share) all up. Those violet ones are still A-mazing and my absolute favourite. The Cinnamon and Peach is also a major winner. I'm not so much into the combo of Passionfruit and Chocolate but it was still good. 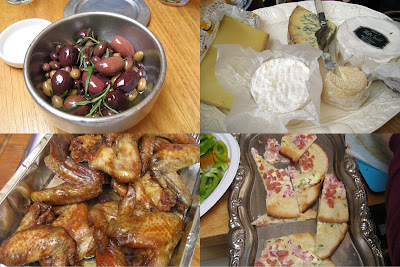 I've got to start finding food blogger events to go to! That looks like a great spread! Wow - wish I could have been there, it looked amazing! gosh.. I'd be more than happy to eat that half eaten Violet macarons. I still have dreams about them. 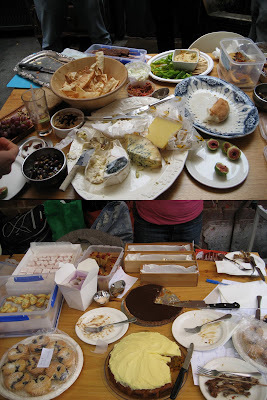 Thanks for an afternoon of food =) Hope to see you all again very soon. You missed me and my skewers! I'm offended. I definitely had a great afternoon, thanks a heap for the organisation. The red capsicum dip is a Stephie Alexander creation, so if you've got the Cook's Companion, you just need some caps, breadcrumbs, walnuts and pom molasses. Looking at your piccies I realised the one thing I missed trying was Asti's salted caramels, dang. But it was all marvellous, and I managed to work off most of my excess with an invigorating game of lawnbowls afterwards! Michael - Hah! I knew I'd forget something. I didn't get a chance to try your skewers :( Will update the post! FoodieFi - thanks for the heads up! I'd love to try making that dip at home; it was soo yum!